Are you nervous, but curious about drawing? Would you like to expand your range of drawing media and techniques? Are you a seasoned artist who would like to start exploring nature as subject? In this hands-on class, you will learn how to expertly combine drawing materials, get comfortable with representational and abstract techniques, and learn how to draw a leaf! During the first half of class, we will master the fundamentals of drawing through a series of fun exercises. 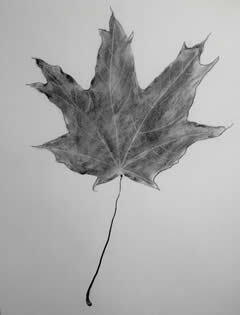 We will then apply our new skills by going outside, picking up a leaf, and drawing the very essence of it. This class delivers quick, satisfying results that will help you fall in love with drawing. We keep the class size small (max. 8) for individual focus and attention. Ages 16 and over.